Each spring, Justin Rudd and his nonprofit 501c3 Community Action Team (CAT) host the National Kids Spelling Bee. First prize is $1,000! Public, private, parochial and home-schooled students are welcome. Get Spelling Bee Email Updates from Justin! I have always been a fan of competition. As a student I participated in lots of contests -- YMCA sports; art, drama, choral & instrumental competitions; geography & science projects; spelling bees and more. When I first moved to California a few years ago, I auditioned for singing/acting jobs and was fortunate to work in many movies, TV shows and several of Disney's special events around the country. My bulldog and I competed on a TV show, "You Lie Like a Dog" on Animal Planet where we won money for local animal charities. And, even today, I continue to participate in running, swimming and biking events. Spelling is important to me. In my current profession as a publicist/event planner, I have to do a lot of writing and reviewing of press releases. Good spelling and grammar are mandatory. When I send and receive e-mail messages, I like to make a good impression by sending documents that have perfect spelling, grammar and punctuation. I don't like to rely on "Spell-Check." I want students to learn excellent spelling habits at an early age. Hence, the creation of this elementary school-level spelling bee championship. The contest is open to the best spellers in the U.S. Hope to see you at the Bee! CHECKS to Community Action Team (CAT), Attn. Justin Rudd, 275 St. Joseph Ave., Long Beach, CA 90803. Nine-year-old Achuth Vinay (center) from Fresno, California, took home the blue ribbon and $1,000 cash at the 2019 National Kids Spelling Bee. FORTY KIDS in grades 3-5 registered for the 18th annual National Kids Spelling Bee held at Bay Shore Church in Long Beach, Calif. At the end of the 150-minute bee, it was 9-year-old Achuth Vinay from Fresno, California, who took home the $1,000 cash prize from Justin Rudd's Community Action Team (CAT). He correctly spelled "ingenue" and "flummox", in rounds 12 and 13 respectively, to win. Achuth is in the 4th grade at Fugman Elementary School in Fresno. Second place went to Shannon Yan. She was eliminated from the contest after misspelling "commissar" in round 12. 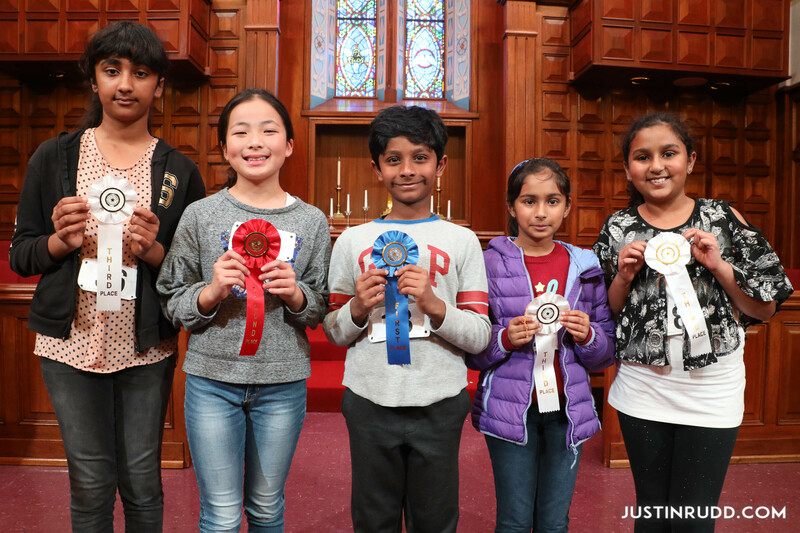 There was a three-way tie for third place for Devananda Anoop, Shradha Rachamreddy and Salena Somalraju when they misspelled "circadian", "Pleiades", and "anemometer" respectively in round 11. Other words from final rounds included: obstreperous, crepuscular, chartreuse, philistine, gnocchi, shibboleth, dudgeon, irascible, and brogue. Bay Shore Church sanctuary, 5100 E. The Toledo, Long Beach, Calif., 90803. Free street parking and free parking lot at the corner of Granada Ave. and Livingston Dr. This bee is for U.S. students currently enrolled in grades 3-5. We welcome students from public, private and parochial schools, as well as home-schooled students. You do NOT need your school's permission to compete. There is no limit to the number of students from a school. Spellers do not have to be endorsed or entered by their school. For the 2 p.m. finals, we will accept the first 100 students to register. If more than 100 students register, we will have a spell-off at approx. 1:45 to see which spellers will advance to the 2 p.m. finals. Remember, all spellers should be present and signed-in by 1:30. The Bee's winner will get $1,000 from Justin Rudd's nonprofit 501c3 Community Action Team (CAT). SAME DAY Rudd and CAT also host the annual National Adult Spelling Bee to be held in Long Beach on Sunday, March 10, 2019, at 4:30 p.m. The Bee is hosted annually by Justin Rudd​ and his nonprofit Community Action Team (CAT)​ and is held at the Bay Shore Church in Long Beach, Calif.
Kate Karp​ is the pronouncer each year. She was the champion in the Adult Bee's first year. Judges include Willa Heart​ and Sharon Sueki​. 2018 WINNERS: Vayun Krishna,10, of Sunnyvale, Calif., receiving his $1,000 cash at last Sunday's 17th annual National Kids Spelling Bee. Vayun is a fifth grader, and he correctly spelled "scapegrace" and "eavesdrop" in rounds 26 and 27, respectively, to win the bee. Second place went to Barron Lee,10 -- a fifth grader from Covina. He misspelled "irreversible" in round 27. Other words he correctly spelled in final rounds included "kipper", "syringe" and "thrive." Third place went to Devananda Anoop, 9, from Aliso Viejo. The fourth grader misspelled "religious" in round 18. The Bee was created and is hosted by Justin Rudd and his nonprofit Community Action Team (CAT)​. The pronouncer for the Bee is Kate Karp​. Prize money comes from the Long Beach Turkey Trot​. The winner of the 16th annual National Kids Spelling Bee was Navneeth Murali, a fifth-grader from Torrance, Calif. He correctly spelled "foray" and "pheasant" to win the $1,000 prize. His two previous words in the bee included "lout" and "dulcimer." Second place went to Ryan Yan, 5th grade, of San Gabriel, Calif. He misspelled "yawp" in round 12. But some earlier words he correctly spelled included "prehensile" and "wherewithal." Third prize went to Kalena Kien, 5th grade, of Anaheim, Calif. She got out in round 11 after missing "holistic." The two previous words she got right were "slavishly" and "lethargic." National Kids Spelling Bee results: First place from Dublin, second place from Torrance, and third place from Folsom. The 15th annual National Kids Spelling Bee took place Sunday, March 6 in Long Beach, Calif. Anisha Rao, 10, from Dublin, Calif., correctly spelled "beatific" and "magnanimity" in the final rounds to win the $1,000 prize. She is in fifth grade at Kolb Elementary School in Dublin. In earlier rounds she correctly spelled words including "aikido", "marzipan" and "pejorative." 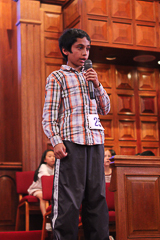 Second place in the bee for kids was Navneeth Murali,10, of Torrance, Calif. He is in the fourth grade at Victor Elementary School in Torrance. He was eliminated after misspelling "scalawag" in round 16. He correctly spelled "alliteration", "unctuous" and "supersede" in some of the previous rounds. Third place went to Xuan Mai Johnson, 11, from Folsom, Calif. She is in the fifth grade at Theodore Judah Elementary School in Folsom. She got out in round 15 after incorrectly spelling "perigee." However, she perfectly spelled "ceviche", "hyperbole" and "capacious" in some of the previous rounds. The bee lasted 2 ½ hours and is hosted annually by Justin Rudd and his nonprofit Community Action Team (CAT) at Bay Shore Church in Belmont Shore. Kate Karp is the pronouncer. Judges included Willa Heart, Sharon Sueki, and Elizabeth Schirmer. The prize money comes from CAT's Long Beach Turkey Trot 5K/10K. THE WINNER of the 14th annual National Kids Spelling Bee (grades 3-5) was Ananya Vinay, 9, from Fresno, Calif. She took home $1,000 in cash after correctly spelling "hydrofoil" in Round 15 and "paucity" in Round 16. Ananya is in the 4th grade at Fugman Elementary in Fresno, Calif. The Bee lasted just under two hours on Sunday, March 1, 2015. Second place was Akia Allan, 10, from Riverside, Calif. He misspelled "medallion" in Round 15. 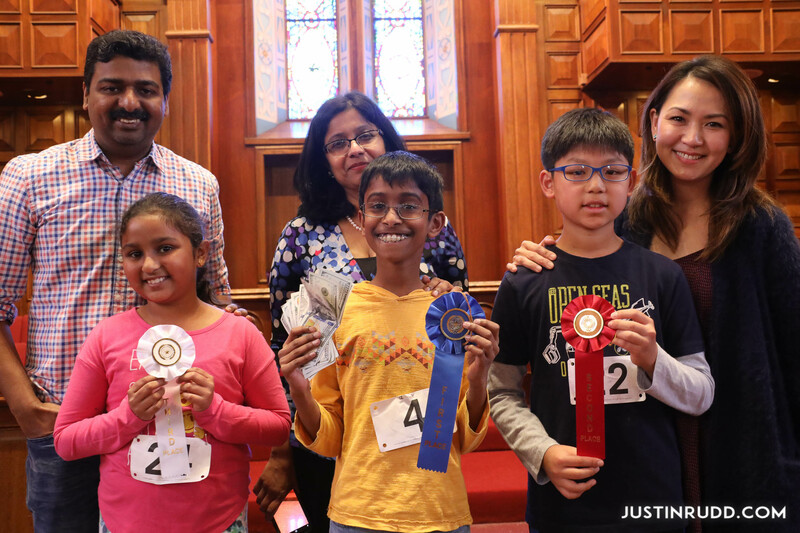 Third place was a tie between Ashna Ahmed, 11, from Yorba Linda, Calif. and Jayani Srinivasan, 7, from Camarillo, Calif.
THIRD-GRADER wins $1,000 correctly spelling morphology and epiphany. PLENTY, ESPECIALLY when it's the rigors of an elementary grade level spelling bee and one of the participants has the opportunity to walk home with a grand prize package that includes $1,000! Words like extraterrestrial, pollution, fiery and phylum must be spelled and spelled correctly under the watchful eyes and ears of judges. If that is not challenging enough for the young students (third, fourth and fifth graders), it must be done while their peers, who are also nervously awaiting their opportunity to shine, look on. The National Kids Spelling Bee is designed to help students improve their spelling, increase their vocabulary, and develop correct English usage. This contest is sure to have some nail-biting, breath-bating competitors. ALL U.S. public, private, parochial and home schools are allowed to enter any number of spellers in the $1,000 National Kids Spelling Bee. Students in grades 3-5 are eligible and words began on a fifth-grade level. STUDENTS ARE ELIMINATED from the competition after misspelling one word. The rules are fashioned after the Scripps National Spelling Bee, a contest for students up to and including grade eight. Is there a study guide for this spelling bee? Who goes first in the competition?